ISLAMABAD: Incumbent President Mamnoon Hussain’s tenure will end on Saturday (today). Pakistan Tehreek-e-Insaf’s Dr Arif Alvi, who was declared the 13th president of the country on Tuesday, will take over the office of the country’s president on September 9. 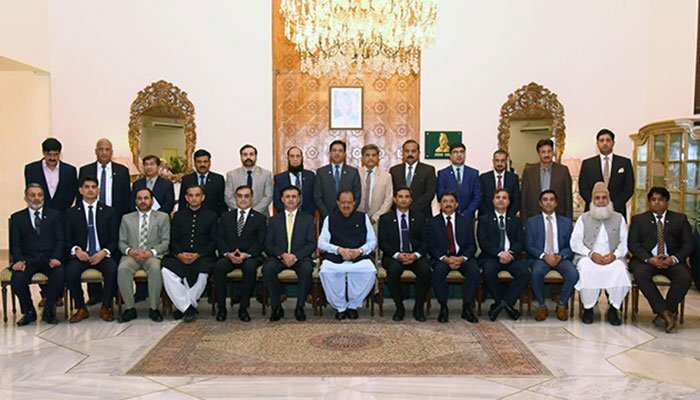 Speaking at his farewell meeting with officers and staff of the President House, Mamnoon said, the country’s development and prosperity lie in rule of law and supremacy of the Constitution. President Mamnoon said he is leaving the presidency after completing his term with “full satisfaction”. “I left no stone unturned in fulfilling the responsibilities given to me by the people of Pakistan,” he added. He also thanked his staff for their cooperation in enabling him to fulfill his official duties in an amicable manner. Moreover, he advised his staff to pay special attention towards the education and training of their children for Pakistan’s better future and development of the society. Originally a businessman, Mamnoon started his career in politics as a Muslim Leaguer in 1969. At the time, he was made joint secretary of the Karachi chapter of the League when former minister of state for foreign affairs Zain Noorani was its president. He did his MBA from the prestigious Institute of Business Administration (IBA) Karachi as well as Darse Nizami course. Mamnoon originally hails from Agra (India). Mamnoon has his textile business and office in Allahwali Market Karachi. He was seen actively involved in the Pakistan Mulsim League (PML-N) since 1993 when Nawaz Sharif was in the opposition. Before Mamnoon was appointed governor of Sindh by then prime minister Nawaz in 1999 to serve in this position for less than six months, he worked as adviser to the provincial chief minister Liaquat Ali Jatoi for an insignificant portfolio. After the promulgation of military rule in October 1999, Mamnoon firmly stood with Nawaz when multitudes of PML-N leaders simply abandoned their party. During the period starting in 1993, Mamnoon held different positions in the Sindh branch of the party. : Incumbent President Mamnoon Hussain’s tenure will end on Saturday (today).